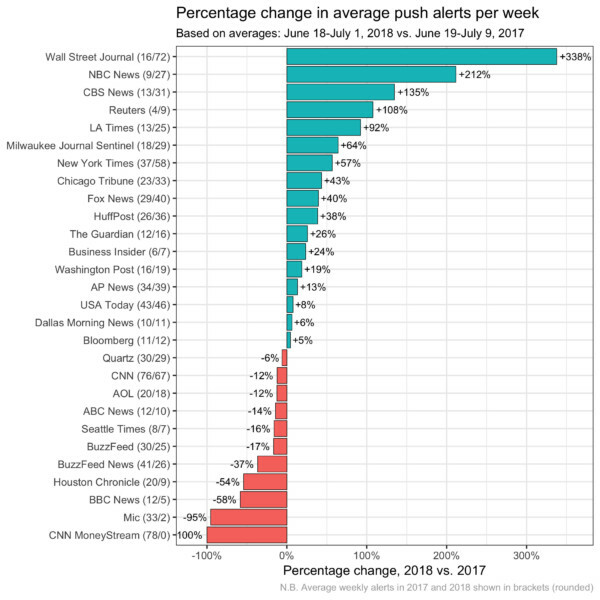 Jan. 4, 2019, 9:56 a.m.
More push alerts, less breaking news, less emoji: An analysis of 30 publishers’ mobile notifications shows that the infrastructure of alerts has stayed the same but newsroom managers are thinking differently about how to use them. In a follow-up study to a 2017 review, Columbia Journalism Review’s Pete Brown collected 1,510 mobile push alerts from 30 news apps over two weeks in June and July 2018, mirroring the previous procedure. 284 alerts alone came from President Trump’s family separation policy and border chaos in 2018, so Brown looked at those again in a case study. “This case study further confirms the ongoing shift away from using push purely for breaking news, a movement we had already observed last year. Notifications categorized as ‘analysis,’ ‘general,’ and ‘first-hand accounts’ comprised over a quarter of all alerts during the family separation controversy,” Brown wrote in his analysis. In an unrelenting year of news, some news app users (a group that grew worldwide in 2017) saw seven alerts just about the family separation policy in one day with CNN, Brown recorded. That’s a lot! But publishers also shifted the experience so the alerts are filled with more text, more conversational, using more adjectives, and pushing more analysis pieces instead of breaking news showering down users’ phone screens during their commute or school pickup. Layoffs also shuffled push alert strategies: “The most prolific alerter from last year’s study, CNN MoneyStream, sent zero alerts during this recent data collection period.” Digiday has reported that MoneyStream faced layoffs in CNNMoney’s transition to CNN Business and became essentially an automatic feed. But Mic, before its November firesale, went from 33 alerts sent on average per week to just two. 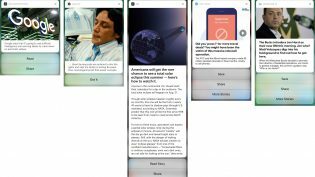 The team had experimented with alerts presenting news in full — so users didn’t need to tap through for the whole story. “We found that roughly 50 percent of users actually used the app in the traditional way, opening it from the home screen. Our explanation was that for many iOS users, Long Press or 3D Touch is still a novel and even undiscovered behavior,” said Marcus Moretti, Mic’s vice president of product. Everyone loves push alerts, but there are problems. Like: What if readers don’t actually open them? For more from app managers’ interviews with Brown and details from the case study, here’s the full report. Schmidt, Christine. "In 2018, push alerts featured less yelling and more thinking." Nieman Journalism Lab. Nieman Foundation for Journalism at Harvard, 4 Jan. 2019. Web. 24 Apr. 2019. Schmidt, Christine. "In 2018, push alerts featured less yelling and more thinking." Nieman Journalism Lab. Last modified January 4, 2019. 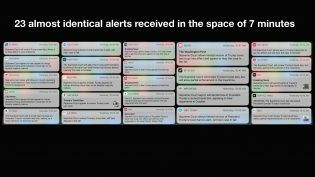 Accessed April 24, 2019. https://www.niemanlab.org/2019/01/in-2018-push-alerts-featured-less-yelling-and-more-thinking/.